This Portuguese warship was involved in revolts in Portugal and in which her crews choose for the Republican side. Dutch newspapers regularly reported about her, some times just a small note other times dealing with her actions during these revolts. She was launched on 12 July 1896 at the yard of Orlando, Leghorn, Italy, completed in 1897 and finally discarded in 1933. Destined for colonial service. With a displacement of 1,729 (normal)-1,757 (full load) were her dimensions 74,0 (between perpendiculars) x 10,7 x 4,65 (maximum) meters. The two vertical triple expansion engines and 4 cylindrical boilers (other sources claimed 8) supplied 4,000 hp driven 2 screws allowing a maximum speed of 18.19 knots. With a coal bunker capacity of 420 tons and a speed of 10 knots was her range 4,600 nautical miles. A 30mm main deck protected her engines and her conning tower was protected by 65mm thick armour. Her crew numbered 237 men. The original armament consisted of 2x1-15cm guns, 4x1-10,5cm guns, 4x1-6,7cm guns, 2x1-3,7cm guns and 3-35,6cm surfaced torpedo tubes (1x bow,2xbeam). In 1919-1922 was she refitted and her armament altered. In 1931 consisted the armament of the 3 torpedo tubes, 2-4.7” guns, 4-4.1’’ guns, 4-3pdrs and 3 machineguns. The newspaper Nieuwe Tilburgsche Courant dated 8 September 1897. The Spanish and Portuguese governments send warships to the Moroccan coast when pirates more and more harassed this area. The capture of the Portuguese bark Rosita Faro by the so-called Rif-pirates was enough reason to send the Portuguese battleships Vasco da Gama and Adamastor. The newspaper Het nieuws van den dag voor Nederlandsch-Indië dated 18 September 1908 reported her arrival in the Dutch East Indies coming from Timor under way towards Lourenco Marques. Her commanding officer was Francisco Vieira de Sa. Her crew numbered 227 men and she was armed with 12 guns. The newspaper Het nieuws van den dag voor Nederlandsch-Indië dated 22 May 1911 published a item dated Lisbon 20 May according to which she departed towards Oporto caused by the reactionary movements over there. The edition dated 12 May published earlier some details about her going towards Oporto in an item dealing with the political situation in Portugal. When a journalist asked Bernardino Machado why she went to Oporto he was answered just for a visit and if necessary to show that the government didn’t allow anyone to disturb the calmness and order. Together with the San Rafael was she driven away by the Adamastor from the mouth of the Livia River at Vianna do Castello. Source Het nieuws van den dag voor Nederlandsch-Indië dated 27 July. The newspaper Rotterdamsch Nieuwsblad editions 10 April and 22 May 1922 confirmed this visit to Oporto especially to prevent riots caused by an eventual monarchist coup d’etat. According to the edition dated 26 May were some persons arrested and brought on board accused of spreading rumours. Sailors of the Adamastor were landed for police duties on the bank of the Minho. A day later reported the newspaper that a part of her landing troops were send to Coimbra. The edition 27 June said that she and the San Rafael landed troops in the northern part of Portugal. That same year she was involved in a search for the Puluto, a ship which was several times seen off the Portuguese North coast probably to join a monarchist conspiracy. The newspaper Het nieuws van den dag voor Nederlandsch-Indië dated 13 May 1913. According to a tiding dated Hong Kong 12 May struck she a rock off the island Dumbell. 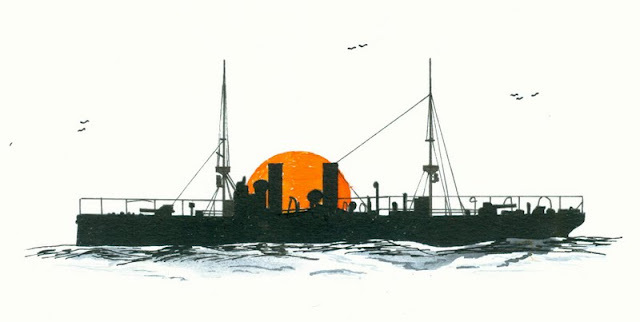 The news item described her as a small non armoured cruiser of 1,750 tons built in 1896. A wireless message was send by her requesting for help. The British destroyer HMS Otter, two tugs and the Portuguese gunboat Patria left Hong Kong to assist her. A later tiding reported that the HMS Otter returned to Hong Kong with the news that the Adamastor was seriously damaged and that her crew and part of the stores were transferred to the Patria. Commodore Austruther departed towards the Adamastor for further assistance. There was still hope that she could be salvaged. The edition dated 17 May published a tiding dated Hong Kong 16 May that she was indeed salvaged. 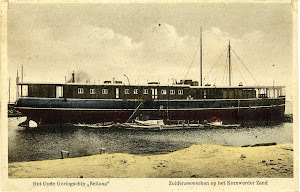 The newspaper Rotterdamsch Nieuwsblad dated 19 May said that she was docked at Kowloon to be repaired. The newspaper Rotterdamsch Nieuwsblad dated 11 January 1911. According to a tiding dated Rio de Janeiro 9 January visited she that year Brazil just some months after her roll in the Portuguese revolt. A large number of Portuguese and Brazilian families visited this cruiser and presented the crew a republican flag. Her commanding officer ordered to hoist this flag which was saluted by the Brazilian battleship Deodora (3) with 21 gun shots. When at 21.00 o clock a group Republicans left the ship were they attacked by Portuguese monarchists shouting “Away with the Republic”. After some men were wounded was the calmness restored by the police. The newspaper Het Algemeen Handelsblad dated 10 January confirmed this visit and the following events. In 1915 was she again involved in reactionary movements in Portugal. In the newspaper Amigoe di Curacao was a article republished from the Dutch magazine Nederlandsch Zeewezen in which a certain W described what happened. He arrived with his merchant ship on 10 May at the Taag for a cargo of cork. Usually anchored large merchant ships off Praçado Commerçio. Close to the quay were four Portuguese warships lying including the Adamastor. In the night of 13-14 May around 15.00 o’clock were guns, machineguns and rifles shooting. and were the warships fighting with the fortresses. One barge of the Adamastor was shot to pieces. The revolt ended 16 May. The commanding officer of the Adamastor who was a known monarchist was killed by a sailor. On board were several prisoners. The newspaper Het Volk dated 18 May mentioned as prisoners admiral Xavier de Brito, commanding officer of the arsenal and Goulard and Maderios, ministers in the cabinet of De Castro. In 1916 was she active in East Africa when marines of her attacked German defence works and siege a factory. The newspaper Het Centrum dated 27 May 1916. The newspaper Het Vaderland dated 2 August 1933 reported that commanding officer was then the later admiral Pereira Nunes. The newspaper Het nieuws van den dag voor Nederlandsch-Indië dated 12 April 1927 published the tiding dated Macao 11 April that she arrived at that port. 1. Miguel Augusto Bombarda (6 March 1851 Rio de Janeiro-3 October 1910 Lisbon), psychiatrist and Republican politician and member of the revolutionary commission which ended the reign of the Portuguese king Manuel II. He was killed by a former patient (lieutenant Aparicio Rebelo dos Santos) of the hospital Rilhafoles on 3 October just before the revolted started. 2. Carlos Cândido dos Reis (16 January 1852 Lisbon-4 October 1910), admiral who committed suicide thinking that the revolt was a failure. 3. This must be the coastal defence battleship Marshal Deodoro launched at La Seyne on 18 June 1898.